Chondroma is a rare type of tumor which occurs in cartilage of bone. It is a slow growing tumor. 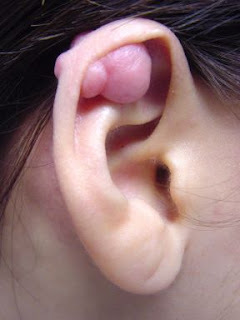 It is composed of cartilage and is totally non cancerous (benign) i.e. does not spread. Benign chondroma is not harmless and distortion of bone may occur via slight compression. In some cases only, it may convert in to cancerous tumor and then it is termed as chondrosarcomas. There are two main types of chondroma tumor i.e. periosteal chondroma and enchondroma. Usually enchondroma tumor occurs in people but periosteal chondroma is rare. Periosteal chondroma may show no symptoms other than pain and slight swelling. Periosteal chondroma is a rare type of chondroma tumor. It occurs on surface of bone. It does not have a list of symptoms but ends on dull pain and sometimes swelling. It is composed of mature hyaline cartilage. It arises from the surface of bone and the inner layer of periosteum is involved. It does not spread and covers medullary cavity. It is found more cellular than enchondroma. It has only limited symptoms but these symptoms persist for longer duration. It may occur at any age but usually people less than 30 years are more prone to it. Periosteal chondroma is also known as juxtacortical chondroma because both of these arises from the surface of bone and core of the bone is not involved. It is present at juxtacortical position of bone and arise from periosteum. It has same features as periosteal chondroma. It mostly occurs in hands and feet. But sometimes it may occur in metaphyseal region of long bones and often appears in proximal humerus. It shows same symptoms as periosteal chondroma shows because of its location. It is usually 3 cm or less. It commonly occurs in males in teen age and after twenties. It is a rare type of chondroma tumor. It is composed of cartilage and can affect lungs. In lungs bronchus is mostly affected by pulmonary chondroma. It is solitary and can affect both males and females. Carney triad is considered a cause behind pulmonary chondroma. If carney triad is the root cause, then stomach cancer named gastric epithelioid leiomyosarcoma and non cancerous adrenal gland tumor named functional extra adrenal paraganglioma accompany pulmonary chondroma. Symptoms of pulmonary chondroma involve chest pain, cough and fever which may further lead to pneumonia, airways obstruction and other complications. Soft tissue chondroma have many synonyms and most common of them is extraskeletal chondroma. It is called as soft tissue chondroma because it occurs in vicinity of bones and joints. It is mainly composed of hyaline cartilage. It usually occur in Middle age people. It appear as lumps at the point of joints in hands and feet especially. Head and neck region is also involved. It is painless type of chondroma. With a simple surgery, people can get rid of these non cancerous benign lumps. Male gender is more prone to this type of rare chondroma.